Waiver: The ISU Masters’ Speed Skating Working Group (IMSSG) and the Webmaster of the IMSSG do not take any responsibility of the contents of Webpages which are linked with the Webpages of the IMSSG. vs. The Minutes of the 28th IMSSC Session 2008 Erfurt have been issued now and can be read also at this website under http://www.imssg.org/08-session-28th-erfurt-minutes.pdf . In these minutes you find a lot more about the 28th IMSSC Session in Erfurt 2008 than the information given below. vs. From next season there will be changes in the Masters’ Speed Skating News ICEOVAL 2008. The Announcements of Masters’ International Competitions will not be issued in ICEOVAL in the future but only on the Masters’ Websites. The participants of the Masters’ Competitions of the last season will not receive automatically and free ICEOVAL 2008. But Iceoval 2008 can be subscribed (yearly fee 10 EUR). All information given in ICEOVAL 2008 can also be found in the Masters’ Websites www.imssg.org and www.imssc.org . vs. Besides the Games there are planned a lot of Masters’ International Competitions for 2008/2009 as every year (see Masters’ International Competition Calendar2008/2009 this Website). New is the exchange of the Masters’ International GRISHIN MEMORIAL against the Masters’ International RUSSIAN CHAMPIONSHIPS. The 28th IMSSC Session 2008 in Erfurt decided this change because it is much more interesting for foreign participants, who have a long journey and additional work for getting visa, to have a competition with four distances in two days instead of a competition with only two distances at only one day. New may also be a Masters’ Competition in Salt Lake City/USA. Andrew Love will clear up the possibility. 2009 Bjugn/NOR 200 participants (3 days). 2010 Innsbruck/AUT 200 participants (3 days). 2011 Calgary/CAN 300 participants (4 days). The places Innsbruck 2010 and Calgary 2011 were decided at the 28th IMSSC Session in Erfurt 2008. The change of the name ”Masters’ Games” to “Masters’ Allround Games” was necessary because of the introduction of additional Masters’ Sprint Games from 2009. Kolomna/RUS as place for the Games 2010, as decided by the IMSSC in 2007, was cancelled because of reasons described in the Minutes of the 28th IMSSC Session 2008 in Erfurt, see this Website. vs. At the 28th IMSSC Session in Erfurt 2008 the quota of the participating nations were decided: CAN 12, FIN 12, GER 23, ITA 12, NED 57, ITA 12, NED 57, NOR 68, RUS 17, SUI 11, USA 9, Other Nations 14 (Sum of possible Entries 235). The entries of the countries GER, NED, NOR, RUS, SUI will be made over the IMSSC Members of these countries, who will carry out the necessary selection of the participants. The entries of the other countries will be made according to the dates of entries. vs. At the 3rd Masters’ International GRISHIN MEMORIAL in Kolomna/RUS at 29 Mar 2008 the number of 68 participants (10 Ladies, 58 Men) from 4 Nations (ITA 4, NOR 1, RUS 60, UKR 2) skated in a well organized competition in the imposing new icehall of Kolomna. The distances were the main distances of the famous Russian skater Evgueny Grishin 500 m and 1500 m. On fast ice good results could be reached. An IMSSC Record could be lowered by Vladimir Budin/RUS M 70 500 m 46,42 (handtime 46,22 + 0,20 sec). The results can be found on the website www.imssur.ru/index_e.shtml . vs. Directly after the Long Distance Races at 19 Mar 2008 the 1st Masters’ International HEERENVEEN SPRINT took place at 20 – 12 Mar 2008 in the icehall Thialf in Heerenveen/NED. 66 Master competitors (11 Ladies, 55 Men) from 6 Nations (CAN 2, FIN 1, GER 4, ITA 2, NED 55, RUS 2) took part in these Sprint Races over 4 distances. A lot of good results could be reached on the fast Thialf ice. 11 IMSSC Records were lowered at the competitions: Points at the 4 distances 500 m, 1000 m/500 m, 1000 m by Clare Scanlon/NED F 35 175,945 points, Anja Bollaart/NED F 40 174,695 points, Barbara Heerschop/NED F 50 184,205 points, Thea Kroontje/NED F 60 192,205 points, Jan Duif/NED M 45 157,770 points, Kees Verdouw/NED M 60 173,050, Wim Brand/NED M 65 177,960 points. Times at single distances by Jan Duif/NED M 45 1000 m 1:17,48 , Kees Verdouw/NED M 60 1000 m 1:25,41 , Piet Hartstra/NED M 65 500 m 44,63 , Wim Brand/NED M 65 1000 m 1:26,63 . Results will be issued on the website www.veteranencircuitlb.com . vs. The 5th Masters’ International LONG DISTANCE RACES were held in the icehall Thialf in Heerenveen/NED at 19 Mar 2008. At this 2 distance competition ( 500 m and 3000 m or 5000 m or 10000 m) 64 competitors (8 Ladies, 56 Men) took part from 6 Nations (CAN 2, FIN 1, GER 3, ITA 2, NED 54, NOR 2). Good Results were reached on fast ice. 5 IMSSC Records could be lowered: Bianca van den Hoek/NED F 30 5000 m 8:16,07 , Wim Brand/NED M 65 5000 m 7:47,59 , Harry Schut/NED M 45 10000 m 14:44,30 , Luit Broens/NED M 50 10000 m 15;12,67 , Harald Paulsen/NOR M 65 10000 m 16:53,61. Results will be issued on the website www.veteranencircuitlb.com . vs. The 17th Masters’ International Games 2008 in Erfurt/Germany, held 29 Feb – 02 Mar 2008, are over. 207 Participants (43 Ladies, 164 Men) from 13 Nations (AUT 1, CAN 12, EST 1, FIN 10, GER 40, HUN 1, ITA 12, NED 57, NOR 39, ROU 1, RUS 14, SUI 14, USA 5) competed in the Gunda-Niemann-Stirnemann-Icehall on good ice. After the Drawing in the wonderful old Townhall of Erfurt on Thursday and the nice Opening Ceremony with a parade of young skaters on skates with the names and flags of the 13 participating Nations the competitions were started Friday. During the three competition days good results were reached at the perfect organized races. Five competitors could lower 13 IMSSC Records (International Masters’ Records): Tatjana Sidorova/RUS F 70, 1000 m 1:50,96, 1500 m 2:50,23, 3 distances race 167,873 points; Piet Hilkema/NED M 35, 3000 m 4:02,17 and 5000 m 6:59,44; Jan Duif/NED M 45, 1500 m 1:56,57; Martin Haire/USA M 45, 3000 m 4:05,75 , 5000 m 7:01,95 and 4 distances race 500 m, 3000 m/1500 m, 5000 m 162,489 points; Wim Brand/NED, M 65, 1500 m 2:12,01 , 1000 m 1:26,28 , 3000 m 4:38,59 and 4 distances race 500 m, 1500 m/1000 m, 3000 m 179,534 points. With the closing banquet with Thuringian specialities, a long but cheerful victory ceremony and the presentation of Bjugn/NOR, the place for the 18th Games in in 2009, the Games in Erfurt were over and the large Masters’ Speed Skating community said good beye to the nice Thuringian capital. All results of the Games can be found under www.eisevents-erfurt.de/masters_17/ergeb_navi.html and http://www.desg.de/?page_id=813&anzeige=event&eventID=6219. Nice reports you find under http://andrewlove.org/blog/index.php and http://mastersspeedskatingnews.blogspot.com/2008/03/17th-masters-international-speed.html and http://mastersspeedskatingnews.blogspot.com/2008/03/chronicles-of-travelling-skates.html. jd. At the 17th Masters’ International Games in Erfurt GER there was lost a racing suit in the dressing room for men of the Gunda-Niemann-Stirnemann-Icehall at 29 Feb – 02 Mar 2008. If you found this racing suit in your skate bag or at another place, please inform the owner by an email to his address jd@boonedam.nl . The racing suit can be seen at www.imssg.org/jduif.jpg . rh. Fifty-four competitors, including 6 women and 48 men from two Nations (CAN 1, USA 53) laced up skates for the season’s edition of the longest-running international competition for masters in Northamerica in Milwaukee/USA, 16 – 17 Feb 2008. This year the event included an open class as well as 5-year age groups for women and men. The mixed racing format consisted of metric (Olympic style) 500 m and 1000 m, plus pack-style (mass start) racing over 300 m, 500 m, 800 m, 1000 m, 1500 m and 3000 m. The pack-style races included a heat and a final in 300 m, 500 m, 800 m, and 1000 m for open class skaters and in the 300 m for men 55+. Report see under http://mastersspeedskatingnews.blogspot.com/2008/02/11th-masters-international-open.html. vs. Last weekend, 16 – 17 Feb 2008 in Berlin the 12th Masters’ International Speed Skating Master Cup took place in Berlin-Hohenschönhausen in the Speed Skating Icehall of the Sportforum. The 106 competitors (24 Ladies and 82 Men) from 10 Nations (BEL 1, EST 2, FIN 3, GER 36, ITA 6, NED 29, NOR 13, ROM 1, RUS 14, SUI 1) competed in the 4 distance races like at the Masters’ Games (Men with 5000 m, Ladies of all age groups and Men of higher age groups with 3000 m). Because last season at the Games in Calgary nearly all IMSSC Records in all age groups Ladies and Men were broken at these 4 distance races with fantastic times, no IMSSC Records could be lowered in Berlin. But nevertheless very good results were reached by the participants at a perfectly organized competition. The complete results are issued under the Website of Speedskating in Berlin http://www.eisschnelllauf-in-berlin.de/PDF/Masters2008.pdf . vs. At 09 – 10 Feb 2008 the 6th Masters’ International Speed Skating SINGLE DISTANCE RACES were held in the famous Olympiahall Vikingskipet in Hamar/Norway on fast ice. 108 competitors (7 Ladies, 101 Men) from 7 Nations (FIN 1, ITA 1, IRE 1, NED 1, NOR 100, SWE 3, SUI 1) took part in these interesting and well organized Competitions with the single distances 500, 1000, 1500, 3000, 5000 and 10000 m (4 distances possible). 17 IMSSC Records were lowered, among them 9 on 4 distance races with 10000 m as longest distance (500 m, 5000 m/ 1500 m, 10000 m), two at 10000 m and two at 5000 m. Results, also results including lap times, can be found on the Website http://www.aktivsk.no . vs. At the 1st Masters’ International Canadian Open in Calgary/CAN at 9 – 10 Feb 2008 the good number of 55 competitors (11 Ladies, 44 Men) from 5 Nations (CAN 44, NOR 2, ROM 1, RUS 1, USA 7) competed in a four distance race (500 m, 1500 m/1000 m, 3000 m). The Canadians came from British Columbia, Alberta, Manitoba, Ontario and Québec. Top times were reached at the competitions, many personal bests and also 7 IMSSC Records from 2007 were lowered: Patrick Kelly/CAN (M 45) 1000 m 1:17,51 , 4 distance race (500 m, 1500 m/1000 m, 3000 m) 162,606 points; Brynjulf Måkestad/NOR (M 55) 1000 m 1:23,07; Knut Nesse/NOR (M 65) 1000 m 1:29,52 , 1500 m 2:13,98 , 4 distances race (500 m, 1500 m/1000 m, 3000 m) 182,228 points; Roy Whithney (M 80) 1500 m 3:08,07. You find a good report under http://mastersspeedskatingnews.blogspot.com/2008/02/1st-masters-international-canadian-open.html and the results under http://136.159.129.160/Competition/Results.aspx?event_id=191 . vs. The participants of the 14th Masters’ International Speed Skating SPRINT CLASSICS in Inzell/GER at 2 – 3 Feb 2008 reached good results and had much fun. At the competition 90 participants (17 Ladies, 73 Men) from 12 Nations (AUT 1, BEL 1, ESP 1, GER 39, ITA 12, NED 16, NOR 3, ROM 1, RUS 9, SUI 4, UKR 2, USA 1) competed at the nice open air track in the German Alpes. For the first time at the SPRINT CLASSICS we had competitors from Spain and Ukraine at the start. After the drawing Friday evening the competitors met for a common supper and for discussions about Masters’ Speed Skating, especially at the next two days. At the first day it was snowing at the first races, later the snowfall stopped. At the second day the weather was wonderful, the sky was blue and the sun was shining. Good results could be reached by the competitors, 4 IMSSC Records were beaten (see http://www.imssg.org/07-Results-Inzell-2008.pdf). vs. The 9th Masters’ International Speed Skating MEETING was held in Davos/SUI at 12 – 13 Jan 2008. At the competition 33 participants (4 Ladies, 29 Men) from 9 Nations (AUT 1, CAN 2, GER 5, ITA 7, NED 3, NOR 2, RUS 1, SUI 10, USA 2) competed on the natural ice of the Eisbahn Davos. At the first day it was strongly snowing and the times were not fast. But at the second day it was wonderful weather, the sun was shining and good results could be reached by the participants on the famous fast natural ice of Davos (see http://www.imssg.org/07-Results-Davos-2008.pdf). Patrick Kelly/CAN (M 45) lowered his own IMSSC Record from 2007 at 1000 m with 1:19,04 sec. vs. The Announcement of the 11th Masters’ International Speed Skating AMERICAN CHAMPIONSHIPS in Milwaukee/USA, 16 – 17 Feb 2008, is now available at http://home.cogeco.ca/~ahanham/MilwaukeeMastersMeet2008.pdf . At these Championships, where all levels of skaters are welcome, you can skate a lot of packstyle races, 300 m, 500 m, 800 m, 1000 m, 1500 m, 3000 m, fun races 5000 m, and also metric races 500 m and 1000 m. The Championships are the most popular Masters’ Competition in USA. You can find a trailer for the competition under http://mastersspeedskatingnews.blogspot.com/2008/01/11th-masters-international-open.html . vs. 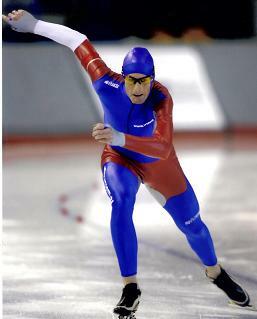 The 1st Masters’ International Speed Skating AMERICAN SPRINT was held in Milwaukee at 04 – 05 Jan 2008. At this competition 32 skaters (6 Ladies and 26 Men) from 2 Nations (CAN 4, USA 28) reached good results at the 4 distance race (first day 500 m, 1000 m/second day 500 m, 1000 m), many personal bests were skated. It was a success! Neverthless we still hope for increasing international participation from Canada and Europe next year. One of the Canadian participants, Ross Hanham, has given a report under http://mastersspeedskatingnews.blogspot.com/2008/01/1st-masters-international-open-american.html. Also Andrew Love, the father of this Masters’ Sprint Competition, has given some information about this event under http://andrewlove.org/blog/?p=532. You can find results under http://www.andrewlove.org/blog/blogpics08/AmericanMastersSprintSamalong.pdf (Table of points) and http://www.andrewlove.org/blog/blogpics08/AmericanMastersSprint2008Results.pdf (Results in detail). vs. The Registration Deadline of the 1st Masters’ International CANADIAN OPEN, which will be held 09 – 10 Feb 2008 at the Olympic Oval in Calgary/Canada, has been extended to the new date 31 Jan 2008, end of January (instead of 8 Dec 2007). So far, about 50 skaters have entered, including American, Norwegian and Russian Masters. See http://www.mastersspeedskatingnews.blogspot.com/2007/12/1st-masters-international-canadian-open.html. vs. At 08 – 09 Dec 2007 the 2nd Masters International Speed Skating REVIVAL was held in Baselga di Pinè/ITA on the nice speed skating track in the Italian Alpes at about 1000 m above sea level. 24 participants ( 2 Ladies, 22 Men) from 4 Nations (GER 1, ITA 18, ESP 1, SUI 4) competed in the Allround Competition (500 m, 15000 m, 1000 m, 3000 m) and reached good results on fast ice ( see http://www.imssg.org/07-Results-Baselga-2007.pdf ). A nice report was issued by Bresin Marcello, the Spanish participant, at his website http://www.exxostenerife.com/speedsk8/00000097390b82426/0000009a100c2df01.html. vs. Because there are structural problems with the Speed Skating Icehall “Krylatskoe” in Moscow, the hall is closed in the moment for speed skating events. The Organizer of the 3rd Masters’International EVGUENY GRISHIN Speed Skating MEMORIAL, Mr. Dr. Ramir Kuramshin, has arranged the problem of transferring this competition to Kolomna in the Region of Moscow at the same date if “Krylatskoe” would not be restored till the 29 Mar 2007.
vs. After the closure of the entry procedure at the 2 Dec 2007, the Starting List is available now, see http://www.eisevents-erfurt.de/masters_17/startlist.pdf. The skaters on the waiting list of the different contries now can see, if they still can start. Skaters who did not get a place should think about a participation in the 12th Masters’ International MASTER CUP in Berlin two weeks before at 16 – 17 Feb 2008. At this competition the same Allround Competition can be skated with international participation on good ice, see http://www.imssg.org/07-Ann.html. It is not booked out until now. vs. The Official Competition Hotels, Mercure Hotel Altstadt and Radisson SAS Hotel, are situated near together (about 100 m) and directly at the Old Town Centre. Near the Hotels (about 300 m) at the place “Anger” you find a tram station of the line No. 1 and 1 N. With this tram you reach the Gunda-Niemann-Stirnnemann-Icehall in about 7 min (station “Landtag”, Thuringian Parliament). You can buy tram tickets in the small office of the EVAG near the tram station (about 50 m) at the “Anger”. vs. In ICEOVAL 2007, International Masters’ Speed Skating News, only one Hotel is mentioned as Official Competition Hotel at the 17th Masters’ Games in Erfurt/GER 29 Feb – 02 Mar 2008 in the Announcement. Now two Hotels are Official Competition Hotels with special rates for the Games participants, Mercure Hotel Altstadt and Radisson SAS Hotel, as can be seen at this Website http://www.imssg.org/07-Ann-Erfurt-Games.pdf in the completed Announcement. vs. If you want to come by plane from a foreign country to take part in the 17th Masters’ Speed Skating GAMES 2008 in Erfurt/GER, the cheapeast and fastest travel probably will be a flight to Frankfurt/Main Airport and a travel by train from Frankfurt am Main/Airport Station to Erfurt Main Station. The train station is directly under the airport and there will be every hour a fast ICE-train to Erfurt, which will reach Erfurt in 2 ½ hours. vs. At the 4th Masters’ International Speed Skating CRITERION in Erfurt/GER, 24th – 25th Nov 2007, 89 Masters (18 Ladies, 71 Men) from 7 Nations (CAN 1, GER 25, LAT 2, NED 42, NOR 12, RUS 3, SUI 4) competed in a 4 distance contest (500 m, 1500 m/1000 m, 3000 m), well organized and conducted by the Thuringian Ice Federation under their President Werner Noack. Already at the first competition of the International Masters in the season 2007/2008 good results were reached. You find in the Internet under http://www.eisevents-erfurt.de/masters_4/ergeb_navi.html endtimes and points of the different age groups. You can also read or print the protocol of the competition with all results, including laptimes, in the Internet under http://www.eisevents-erfurt.de/masters_4/ER2007-11-24.doc. Five IMSSC Records of the List 2007 (International Masters’ Records) could be lowered: Kaska Rogulska/NED (F 35) 1000 m 1:25,18 and 4 distances 176,018 points; Jan Buisman/NED (M 45) 4 distances 170,199 points; Knut Nesse/NOR (M 65) 1000 m 1:29,37 and 4 distances 183,883 points. vs. The Announcement of the 1st Masters’ International AMERICAN Speed Skating SPRINT in Milwaukee/USA, 05 – 06 Jan 2008 has been issued now. The Sprint is a four distance race, 500 and 1000 at the first day and again 500 m and 1000 m at the second day with changed inner and outer lanes. You can find the Announcement and the Entry Form in the Internet under www.imssg.org/07-Ann-Milwaukee-Sprint.pdf . vs. From time to time actualized Entry Lists are issued now in the internet for the 4th Masters’ International CRITERION Erfurt/GER Nov 2006 under www.eisevents-erfurt.de/masters_4/entry_list_04.pdf and for the 17th Masters’ Interational Games Erfurt/GER Feb/Mar 2007 under www.eisevents-erfurt.de/masters17/entry_list_17.pdf . vs. Now the Announcement of the 1st Masters’ International Speed Skating CANADIAN OPEN, Calgary/CAN is out. It has been published since about two weeks on this Website including an Entry Form, see http://www.imssg.org/07-Ann-Calgary.pdf . vs. Entries for the 14th Masters’ International Speed Skating SPRINT CLASSICS, Inzell, 02 – 03 Feb 2007, are again possible electronically from this webpage. This procedure of entries was tested successfully last season. vs. ICEOVAL 2007, International Masters’ Speed Skating News, now has been published and was sent to subscribers and competitors of International Masters’ Competitions in 2006/2007. The issue consists of two booklets. The main booklet contains reports and results from competitions in the last season, the IMSSC Record List 2007, Ice Crystals – small but important news, the IMSSC Constitution and Rules in the last version, the Competition Calendar 2007/2008 and much more. The second booklet contains the Announcements of the Competitons 2007/2008 with Entry Forms. Now the interested competitors can enter nearly all competitions of the season, also the Masters GAMES in Erfurt/GER. Unfortunately the announcements of the competitions in Canada and USA are still missing. They will be issued on this webpage as soon as received. The announcements already issued in ICEOVAL 2007 will additionally be issued on this webpage next week. From 2007/2008 IMSSC Records will be possible for a Masters’ Men Allround Big Competition: 500 m, 5.000 m/1.500 m, 10.000 m from season 2007/2008, as decided on the 26th IMSSC Session in Feb 2007 in Calgary/CAN. These distances can be skated at the Single Distance Races in Hamar/NOR. 3rd Masters’ International EVGUENI GRISHIN MEMORIAL, Moscow/RUS (Krylatkoe Icehall). The Organizer of the 17th Masters’ International Speed Skating Games,the Thüringer Eissport-Verband (Ice-Sports Federation of Thuringia), accepts 175 participants (respectively 206 entries, by experience about 15 % loss of participants by illness, etc.). The quota of entries for the different nations are CAN 12, FIN 9, GER 40, ITA 12, NED 50, NOR 35, RUS 15, SUI 12, USA 6, Other Nations 15, according to the unanimous decision of the IMSSC at the 26th Session in Feb 2007 in Calgary/CAN. If the Organizer in Erfurt is ready to heighten the number of participants, the additional entries shall be added to the quota of Other Nations. vs. The IMSSC decided at the 26th Session in Calgary/CAN in Feb 2007 that Kolomna/RUS shall be the place for the GAMES in 2010. Kolomna is a town of about 150.000 inhabitants with a historical nice old town center, about 120 km northeast from Moscow. It can be easily reached from Moscow by train in 2 hours. vs. The previous organizer of the Masters’ SINGLE DISTANCE RACES/Hamar 2008 will not organize the races in 2008. A new organizer must be found. Therefore we have changed the date of these races again from “confirmed” to “planned” in the Masters’ Competition Calendar 2007/2008, see www.imssg.org/07-calendar-07-57.htm .